A customer’s overall experience with a product is influenced in multiple ways. When the product is commercial trucks and school buses, it is easy to understand why service and after-sale support is so important. Every day that a vehicle is out of service is costly and inconvenient. We want to ensure that even the most challenging repairs are completed for our customers as quickly as possible. Reducing vehicle downtime should be a primary goal for all of us, and we can each contribute to that effort. Effective communication between the service center and ROUSH CleanTech is key. Our support team is fully committed to being accessible and responsive. Ninety-six percent of all incoming calls to our 800-59-ROUSH support line are answered by a qualified support agent who is ready to help. Emails to our support inbox at support@roushcleantech.com are typically responded to within the hour. We are available weekdays between 8 a.m. to 5 p.m. Eastern, and messages received after hours are promptly returned the next business day. The most efficient way to communicate with us on a warranty repair is by opening a case through our Online Warranty System. The sooner a case is opened, the sooner we can identify the problem and start working with you toward a solution. Your case will be assigned to one of our Technical Support Agents who can walk you through diagnostic and repair procedures, ship warrantied replacement parts via Next Day Air, and approve labor reimbursements. Our support agents are focused on moving their cases through these steps as quickly as possible, but we need your help. If a ROUSH CleanTech support agent emails you to request vehicle diagnostics, it means we don’t yet have the information we need to provide a replacement part under warranty. The faster you respond to that diagnostic request, the less downtime for you. Talking to the right person is also critical. Ideally, the person opening the case with us would be the same person who is repairing the vehicle. We are happy to provide anyone at your organization access to your warranty cases. You can register here. It’s especially important that the technicians remain in close communication with us throughout the repair process. Please take a moment to participate in a brief survey to help us better understand your organization and identify the key players who can join our effort to reduce vehicle downtime. If you have any question, please contact our Customer Support Manager, Travis Wolf at Travis.Wolf@roush.com. Our Field Service team continues to grow and evolve as we learn to serve you better. We’ve regionalized the team, led by Mario Genovese. 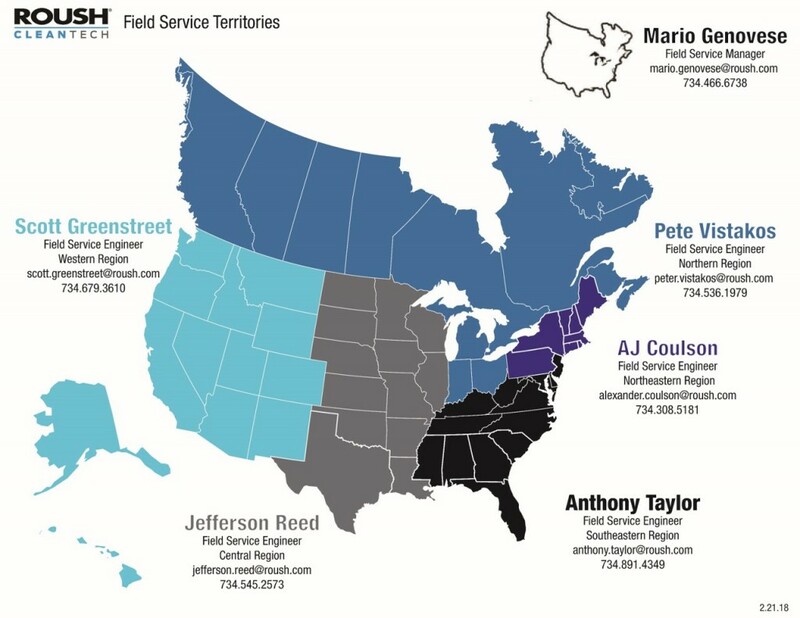 It now includes five territories each managed by a dedicated field service engineer. This model allows us to focus our attention on how we onboard service centers and to proactively support our dealer and service centers, ensuring the integrity of our network. The Field Service team is your point of contact for any questions you may have about being part of the ROUSH CleanTech service network. If you’re having trouble working on a repair, have a technical question or simply want to talk to someone from our team, your regional Field Service Engineer is here to help. Mario has been with ROUSH CleanTech since 2011. Mario manages the entire regional field service team and helps them provide remote and on-site service support on our propane fuel system products. 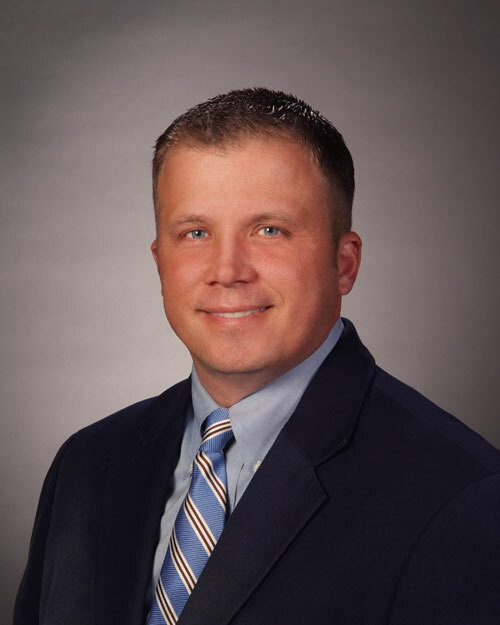 AJ brings five years of experience from multiple Ford dealerships to our team. In addition to his full-time job, AJ is the second in command of his local U.S. Naval Sea Cadet unit, which is the U.S. Navy and Coast Guards youth group. Scott began his career working for import dealerships, then spent 15 years with U-Haul. He’s an ASE master technician and is L-1 certified, as well as a U-Haul master technician. Jefferson has over 20 years of experience as an automotive technician. The last 10 years of that were with Ford dealerships, where he became a Ford Master Technician. Jefferson also served four years on active duty with the United States Army. Anthony works closely with service centers to provide support and training to technicians on ROUSH CleanTech propane autogas fuel systems. He has more than 24 years of automotive experience and 16 years with the Ford brand. With more than 45 years of automotive experience and 40 years with the Ford brand, Pete is always willing to lend a helping hand. He provides support to service centers by training technicians and assisting customers. Improve the service network coverage / quality of the network. Reduce service center queue-time to two days or less. Develop a service center report card. Thanks for partnering with ROUSH CleanTech. If you have any questions, please contact Mario Genovese at Mario.Genovese@roush.com. In this 1-hour webinar, Todd Mouw and Ryan Zic address the Truth About Alternative Fuels and the benefits a school district would experience by switching to propane, with the most notable benefit being the lower total cost of ownership. ROUSH Mustang Contest Revs Up! For those of you who sold a propane school bus this fiscal year, you’ve been entered to win a brand new 2018 ROUSH Mustang as well as quarterly prizes. We held our first quarterly drawing for four $250 Visa gift cards. WINNERS: Please reach out to your ROUSH CleanTech alternative fuels sales representative to claim your prize. Not familiar with the contest? The grand prize is a ROUSH Stage 3 Mustang valued at more than $60,000. For every propane bus you sell starting on November 20, 2017, you automatically earn one entry to win. So far this fiscal year, over 700 propane school buses have been sold. At the end of January, Wilmington Trust filed a Notice Beneficiary Designation, which provides every state, Puerto Rico, the District of Columbia, and a contingent of Tribal Nations with authority to begin distributing each’s allocation of Volkswagen settlement funds. However, before doing so, each state must publish a Beneficiary Mitigation Plan and make it publicly available for at least 30 days. We must engage with state agencies immediately to create financial incentive opportunities for propane school buses. As a reminder, states can select which fuel and vehicle types they want to fund. Without active engagement, we run the risk of not having funding for buses fueled by propane. As a next step, we highly recommend contacting Chelsea Jenkins, Chelsea.Jenkins@roush.com, to discuss how best to approach your state agencies. Q. How long have you been in the school bus industry? A. I’ve been in the industry for 11 years. 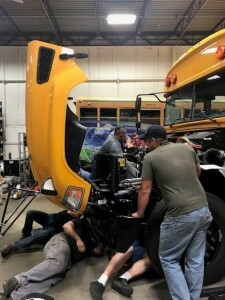 When I started in bus sales, I was selling school bus parts. One of my regular customers was Cook School Bus Lines. Q. How did you start the propane bus conversation with Cook School Bus Lines? A. I started with the fuel conversation. I offered all the information I had about propane. We didn’t have a propane bus demo yet, so I took a gasoline bus to his site to show him something other than diesel. Q. Did this influence his purchase? A. Yes. At first, his order was for 18 propane and 30 diesel. After our discussions, Cook School Bus Lines did some more research on its own and spoke to current propane customers. The company then reversed the order — 30 propane and 18 diesel! Q. Did you advise him on fueling infrastructure? A. Cook School Bus Lines has infrastructure on its property that needs to be updated. They are already working with two propane providers to get that done. Q. What is your motivation to sell propane buses? A. My relationship with my customers is my strongest asset and I want what is best for them. This was my first big propane sale, and now I’m incredibly motivated to sell propane. There’s a prestige behind selling propane and I’m glad I’m finally feeling it! Q. 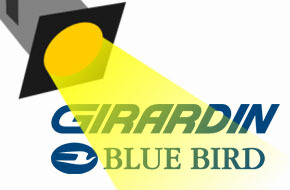 How does Girardin Ontario promote alternative fuels? A. Normally, we each have a propane demo to take to customers, and the company is really good at doing ride & drive events. It’s definitely a group effort. Good news — two tax credits that affect propane autogas fleets have been extended! The Alternative Fuel Excise Credit and Alternative Fuel Infrastructure Tax Credit have been retroactively extended through December 31, 2017 — a year past their original expiration of December 21, 2016. Why the excitement? Propane autogas is cheaper than gasoline by up to 40 percent and diesel by about 50 percent, and now the tax credit of 36 cents per gallon of propane is available for any fleet that purchased propane autogas last year. And, for those of you who installed propane infrastructure, the fueling equipment is eligible for a tax credit of 30 percent of the cost, not to exceed $30,000. Keep in mind that propane infrastructure is already the lowest cost of any transportation energy source — conventional or alternative. We need to make sure that we’re not always playing catch up with legislation. 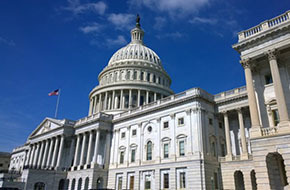 There has been a lot of discussion around the industry’s approach to these tax credits. Contact your elected officials and voice your support for the continuation of these incentives. Just a few minutes of your time will show our elected officials that you back alternative fuel credits — now and for our future. Additionally, Clean Cities coalitions need your support. Since its inception in 1993, the Department of Energy’s Clean Cities program has worked to cut petroleum use in transportation through local outreach and education with stakeholders in their region. They have encouraged the use of alternative fuels and advance vehicle adoption, and now they need our help to ensure Congress recognizes their value. Please reach out to your representative and express your support. To learn more about current legislation and programs for propane autogas vehicles, call us at 800.59.ROUSH or contact Chelsea Jenkins, executive director of government affairs, at Chelsea.Jenkins@roush.com. Check out what Kentucky School Districts are saying about their propane powered school buses.